What I love to do that feeds my soul is read the Bible with no agenda. Most of the time that I carve out to read the Bible is to preparing to lead a Bible Study or a Bible study that I am participating in, or a daily Bible reading plan or read family Bible texts and devotions aloud. These are all worthy activities, but I don’t really get the same comfort, insight or relationship with God when I read assigned texts. I have come to discover that I need time to read a verse or paragraph and just savor it. The Word of God is sweet indeed and consuming it too quickly doesn’t allow me to absorb the full flavor. There are numerous texts that fly past my eyes everyday. I have flip books of Bible verses, Bible app daily readings that flash upon my screen, Lectionary readings, Sunday School lesson texts, Bible Study texts, etc. Some days my day is full of the Bible and yet I rush on without much time listening to God. How can a life that is full of The Word be so over-run with external and internal noise that I can’t hear God? I have learned much over the last year. I read Quiet: The Power of Introverts in a World That Can’t Stop Talking, by Susan Cain and discovered that although I “outgrew” my childhood shyness I am still an introvert, and a highly sensitive person. I am aware of every noise and stimuli. I don’t hear God speak through The Word when my attention is constantly pulled away by the sound of the TV in the next room. I am wearing ear-plugs as I write this so I can hear myself think. In reading Bonnie Gray’s anticipated book, Finding Spiritual Whitespace I found a sensitive Christian lady who had mastered the art of busy only to discover that we sometimes hear God best through brokeness. Her book has caused me to think about time set aside for creativity and communion with God in new ways. While each of us has a unique story, I find myself burning down to a dim ember in part because I do not find time for my spirit. I study The Bible. I work. I plan. I serve my family, friends and church. I even try to carve out time to serve the world in small ways, but I rarely find time for my spirit to listen. The noise drowns out the stillness that is necessary for me to really listen to God. Lately I have been looking for a key Bible texts for each day that really spoke to my heart. This is harder than it sounds. The most difficult part is finding time to listen and pray over what God might be trying to speak into my spirit with that text. I am finding myself with more insomnia lately. I wake in the middle of the night and can’t fall back to sleep. I lie there trying to think happy thoughts so I can fall back to sleep. Last night I thought that it would be lovely if I found a verse each day and then found or made a visual image to illustrate what it means to me. The ridiculousness of this idea can only be blamed on sleep-deprivation. I would have cast it aside without another thought except that today the key verse was on the flip book on my desk. All afternoon as I worked that verse distracted me. 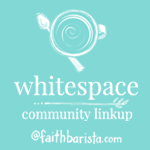 I didn’t have time to think about what God was trying to speak to me, but when I looked at the journaling prompt from Bonnie Gray for week one of the Finding Spiritual Whitespace book club I knew it was all connected. Thank you for sharing your heart on studying the Word. Isn’t it amazing how we, in our humanness, so easily twist what is good & simple to be “bad” & complicated? I think your idea of making a verse each day into a visual image is a good one – I recently got a Journaling Bible just for this purpose. What I quickly discovered is making it an each day activity made it into a to-do…but having the Journaling Bible and the supplies (pens, color, etc) quickly available has been awesome! I hope you discover a way that works for you!